Construction is due to start next month on a new cycle hub in Rochdale, next to the railway station and metrolink stop. The hub is being developed by Transport for Greater Manchester to encourage people to cycle to work by providing secure cycle parking facilities. It is due to open in the summer. 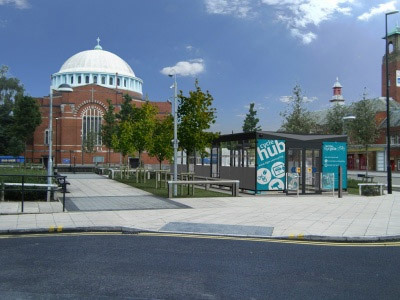 Rochdale’s hub joins existing facilities in Bury and Ashton and will have 42 cycle parking spaces, with lockers for storing cycle helmets and other cycling accessories. Councillor Andrew Fender, chairman of the TfGM committee, said: “Rochdale’s new cycle hub will give people a safe and secure place to leave their bike and it is in a great location for cyclists to continue their journey by tram or train. Membership of the Rochdale cycle hub will cost £10 a year, which will also give access to hubs already open at Bury and Ashton. TfGM is planning to open more district cycle hubs throughout the region as part of its commuter cycling project, which is being supported by the Department for Transport’s local sustainable transport fund.